If you’re looking to upgrade your smarthome with a video doorbell, you’ve probably been dreading the re-wiring that’s necessary for power and AV cables. 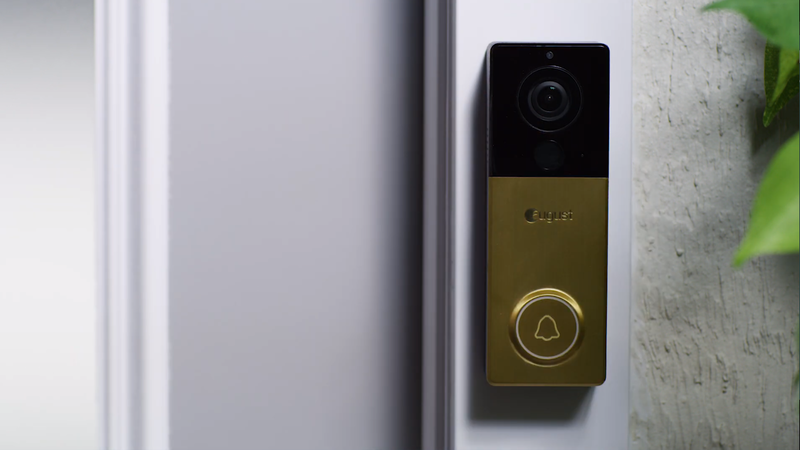 August has a solution: its new View doorbell cam, available on March 28th for $230. Most smarthome tech of this kind assumes a semi-permanent installation, but the August View uses a swappable 6500 mAh battery to power its Wi-Fi connection and camera. The company makes no claims as to battery life, but assuming it’s only drawing full power when the camera detects motion or a ring, that should last a few weeks at least. And that wireless setup allows it to mount to a standard base plate. The View works with August’s existing smart locks, which can similarly mount to a basic internal lock. Naturally, the connected app can open an August lock right from the video view. The system works with both Amazon’s Alexa and Google’s Assistant smarthome platforms, but Apple Homekit support is notably absent. The View can stream video anywhere at up to 1920 x 1440 resolution, with night vision and digital zoom supported as well. Interchangeable brass faceplates let you match your door’s existing fixtures, and IPX5 water resistance should keep it safe even in heavy rain or an extended freeze.